Oregon plant breeder and author Carol Deppe holds a PhD in Genetics from Harvard University and specializes in developing open source crops for organic growing conditions, sustainable agriculture, and human survival for the next thousand years. Carol's gardening books include the recently released The Tao of Vegetable Gardening: Cultivating Tomatoes, Greens, Peas, Beans, Squash, Joy, and Serenity (Chelsea Green, January 2015) as well as as The Resilient Gardener: Food Production and Self-Reliance in Uncertain Times (Including the Five Crops You Need To Survive and Thrive-Potatoes, Corn, Beans, Squash, and Eggs) (Chelsea Green, 2010) and Breed Your Own Vegetable Varieties: The Gardener's and Farmer's Guide to Plant Breeding and Seed Saving (2nd ed.) (Chelsea Green, 2000). 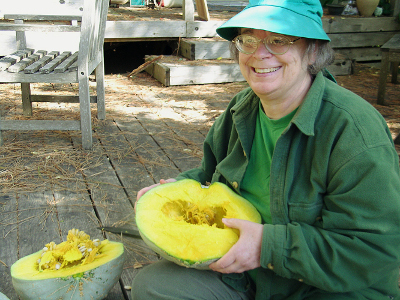 Her work has also appeared in Horticulture Magazine, National Gardening, Organic Gardening, AcresUSA, Grist, AlterNet, and elsewhere. New varieties Carol has developed include two winter squashes ('Candystick Dessert Delicata' and 'Sweet Meat—Oregon Homestead'); two flint corns ('Cascade Ruby-Gold' and 'Cascade Creamcap'); five flour corns ('Magic Manna', 'Pancake White Manna', 'Brown Gravy Manna', 'Parching Red Manna', and 'Parching Starburst Manna'); and five dry beans ('Hannan Popbean Garbanzo', 'Fast Lady Northern Southern Pea', 'Beefy Resilient Grex', 'White Candle Gaucho', and 'Beef-Bush Gold Resilient'). See the Fertile Valley Seeds section of this website for variety descriptions and ordering information. Carol is a member of the Board of Directors of the Open Source Seed Initiative.